The Gullah Geechee people of today are descendants of enslaved Africans from various ethnic groups of west and central Africa, who were forced to work on the plantations of coastal South Carolina, Georgia, North Carolina, and Florida. 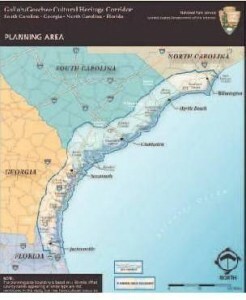 This coastal region with its many barrier islands is separated from the mainland by creeks, rivers, and marshes. The geographic isolation from outsiders and strong sense of family and community allowed the Gullah Geechee people to maintain a separate creole language and developed distinct culture patterns, which included more of the African cultural tradition than African-American populations in other parts of the United States. After the Civil War the island plantations were for the most part abandoned. The people of the region were able to maintain language, arts, crafts, religious beliefs, folklore, rituals and food preferences that are distinctly connected to their West African roots and to the natural resources of the coastal ecosystem. The islands were accessible only by boat until the first bridges were built around 1950. Coastal development, changing job markets, and population shifts have forced many Gullah Geechee people to leave or, in many cases, lose lands that had been in families for generations The traditional economy of farming, fishing, hunting, and small-scale marketing of subsistence products, most famously sweet grass baskets, was largely destroyed by real estate development. First came the northern owned hunting clubs and estates, later military bases, and then resort and second home development. This encroachment by outsiders has resulted in out-migration and economic hardship. The remaining communities illustrate the negative as well as positive impacts of burgeoning tourism and large-scale economic development in coastal regions of the American South. These changes threaten Gullah Geechee cultural survival and their distinct identity as a people who have survived since colonial times. Long recognized as one the uniquely American cultural landscapes, the Gullah Geechee community sought designation as a National Heritage Area as a way to preserve and sustain their story and way of life. Championed by South Carolina Representative James E. Clyburn, Congress authorized the Gullah/Geechee Cultural Heritage Corridor (the Corridor) in 2006 designating a region from Wilmington, North Carolina to Jacksonville, Florida. It includes around 80 barrier islands and continues inland to adjacent coastal counties, defining a region 30-miles inland known as the Low Country. A federal commission made up of local representatives who collaborate with the National Park Service (NPS), and state, and community partners manages the corridor. Recently, the commission released for public comment a management plan for the corridor prepared in cooperation with the NPS Denver Service Center. Comments on the management plan may be submitted by any one of two methods: 1) visiting the NPS PEPC (Planning, Environment and Public Comment) Web site: http://parkplanning.nps.gov/guge, or 2) mailing: Gullah Geechee Cultural Heritage Corridor Commission, c/o Commission Chairman, 1214 Middle Street, Sullivan’s Island, SC 29482. Additional information about the Gullah Geechee Cultural Heritage Corridor is available on the Commission’s website: www.gullahgeecheecorridor.org.